You have a presentation in 10 minutes and you realize that a key element of the project you have been working on for weeks is wrong! The oversight happened at the beginning of the project and now all the work you did has been an utter waste of time. Enter scrum. The term scrum is borrowed from rugby. In rugby the only way you score is by getting the ball across the goal line and touching it to the ground. The way this is done is by moving the ball up the field as a group or scrum and handing the ball lateral or backwards to another teammate. If a ball carrier gets tackled he then must release the ball without stopping play. Well if that is not full of metaphors I am not sure what is. 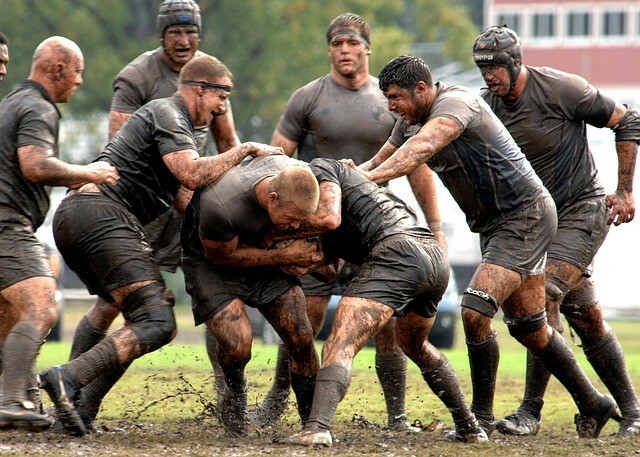 For scrum to succeed you must play as a team. The key is for each teammate to only carrying the project/ball for short periods of time. This allows for quick progress up the field without being tackled, i.e. make major progress on your project, and avoid being roadblocked. Scrum utilizes each individual teammate’s strengths and avoids individual fatigue. Your team usually does not go straight up the field but rather zig-zag’s up, always making progress. One advantage of scrum is that it allows you to identify problems at the source as a team and either allows you to solve them at that moment or avoid them altogether. Many brains are always better than one, and each team member has a unique perspective on the project that provides valuable insight. Scrum is a tried and true agile technique that creates an atmosphere of teamwork and progress that our team has been capitalizing on. It allows you to proactively tackle problems at the source rather than reacting to them in the future. For a quick breakdown of how scrum works, check outthe video below.